Stony Brook, NY, January 13, 2015 - In partnership with New York Sea Grant, New York State Department of Environmental Conservation (DEC) Commissioner Joe Martens today announced $89,000 in grants for four projects that will help Great Lakes coastal communities to increase storm resiliency and protect water quality. Coastal communities along 700 miles of New York Great Lakes’ shoreline are vulnerable to storm surges, flooding, shoreline erosion, and the impact of over-development. Inland communities also experience flooding and erosion as a result of wetland loss and degradation, improper stream management, and excessive development of floodplains. 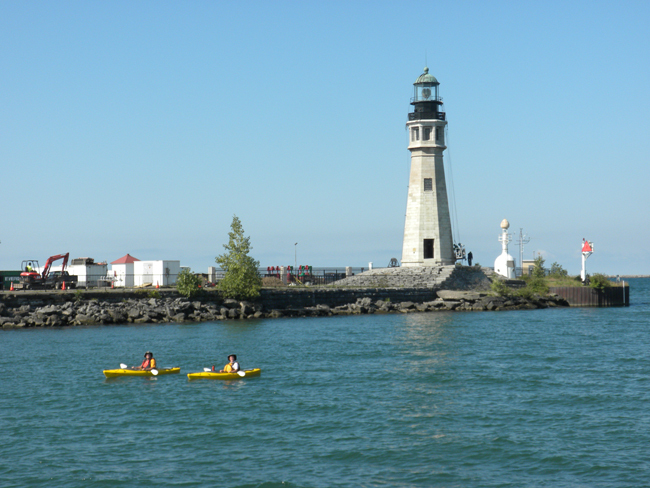 Buffalo Niagara Riverkeeper: $24,482 to improve coastal resilience and community stewardship along Grand Island’s shoreline by engaging shoreline property owners and municipal officials through a combination of technical assistance, and public outreach and education. Program activities will target stretches of shoreline experiencing significant erosion and habitat degradation problems. Wayne County Soil & Water Conservation District, in partnership with the Village of Sodus Point: $25,000 to use a combination of natural vegetation and rock to stabilize an eroding section of shoreline and protect nearby at-risk sewage infrastructure in the Village of Sodus Point. Ultimately, this project will strengthen coastal resiliency by protecting wastewater infrastructure and reducing vulnerability to erosion and coastal storm impacts. Oswego County Soil & Water Conservation District: $25,000 to use an ecosystem-based management approach to identify and assess available shoreline management methods for the North Pond inlet and coastal dune barrier of Eastern Lake Ontario. The project’s findings will be used to inform an inlet management plan that balances the needs and uses of the local community, while achieving ecological stability within this unique barrier-pond ecosystem. Stony Brook University: $14,985 to investigate the potential impact of seiches--standing waves commonly caused by wind--on beach erosion along New York’s Lake Erie shoreline. This project may have important resiliency implications for coastal engineering practices, which have not typically considered seiches in shoreline protection design. New York’s Great Lakes Basin Small Grants Program is a project of the state Environmental Protection Fund’s Ocean-Great Lakes Ecosystem Conservation Program. Grant projects support the goals of an Interim NYS Great Lakes Action Agenda, a plan for applying ecosystem-based management to complex environmental problems in order to conserve, protect and enhance our irreplaceable Great Lakes natural resources. For more information on the Interim NYS Great Lakes Action Agenda, visit DEC’s Web site. Connect with DEC on Facebook, Twitter and YouTube.